The school is located in the garden of a nice villa in the safe, central and green Pinares neighbourhood. There are two comfortable fully equipped classrooms. During the breaks students can enjoy the garden. There are many shady areas and when the weather allows it, conversations lessons are giving here as well. The school has Wi-Fi throughout and there is a computer for the students to use. There are two bathrooms. The Atlantic ocean is at two blocks from the school, so whenever the weather allows it, classes on the beach can be given. 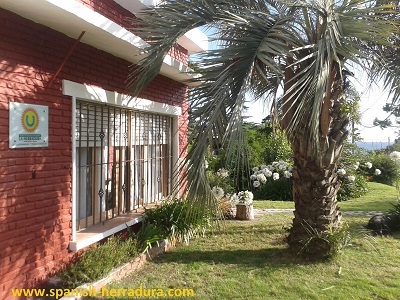 The school is located about 10 blocks from the centre of Maldonado, 2 blocks from the nearest beach and 4km from the centre of Punta del Este. There are shops, restaurants, supermarkets, bus services and an ATM withing a five-block radius. The main bus terminal is also within walking distance, so it is easy to plan and make trips outside of Punta del Este at the weekends.